I had to work early Saturday morning (2am-9am), so I got a late start on this, but I thought I could squeeze in a hike due to the long days. Fortunately, I was correct, and had enough time to complete the hike before dark, although this was a rather challenging hike for me. After about 3 hours of sleep, I left home (after lunch). Fortunately, the drive isn’t that long. One of the things I was worried about was the snow level. I did run into snow, but only on the north side of Githens Mountain. Other than that, there was really no snow at all – well, except for where the White Iris trail crosses the road (4614?). There is still a couple of feet right there. It was challenging for me because I had a very tough time following both trails – there was a variety of reasons – snow, clearcuts, faint trail, etc. The plan was to start at the Bissell trail, go down it to the junction with Old Baldy, follow it to the junction with White Iris trail and take that back to the 4615 road and then walk it back to the start. To start off, I had a hard time finding the start of the Bissell trail – I’m sure I was at the specified location, but it went up into the woods and I didn’t see any real trail for a while. I searched around and finally found it and followed it pretty well for a while and then I lost it. 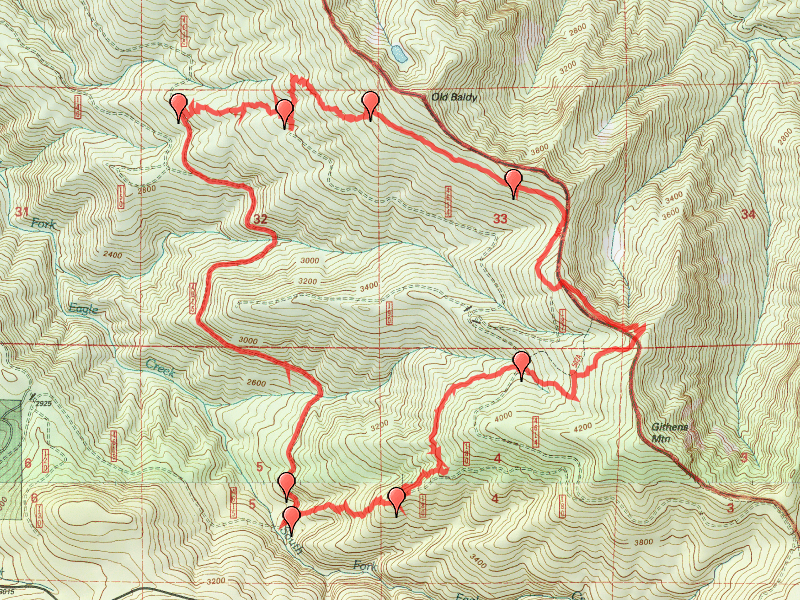 I ended up doing LOTS of cross country travel on this hike. After a while I got back on it and followed it up to Old Baldy and followed that for a while, but right around Githens Mountain, probably where the trail takes an easterly turn, the snow appeared, and it was deep – 2′ plus and it came up all at once. I lost the trail at that point (and the junction with White Iris). I did some cross country bushwacking for a while, and finally found it and followed it up until the clearcut, at which point I lost it completely. I ended up just heading downhill. I’m not sure I ever did really find it after the clearcut, although I found small sections that looked like the could have been trail, but were probably game trails. I eventually ended up back on road 4615 about a tenth of a mile south of where the GPS coordinates said the White Iris trailhead was. I didn’t see anything that looked like a trailhead at the waypoint that was provided. On the way back, I looked for the trail from the road but still didn’t see anything. I guess I didn’t earn my “Savvy Woodsman Adventurer badge” on this hike, but I felt pretty good about navigating successfully even with losing the trails. That is a good day for me. I was a little challenged, but rose to the occasion. After doing all the cross country travel, I didn’t mind walking back the road! Other than losing the trail so many times, it was a pretty uneventful hike. The view from the clearcut on White Iris is wonderful! And I just missed the blooming of the Clackamas Iris – looks like they will be blooming in a few more weeks. But I did see why that trail is called the White Iris trail – WOW, what a lot of wildflowers and Iris! It must be absolutely beautiful when the iris are blooming! While hiking the Bissell trail, I also found one of those wildlife cameras attached to a tree. It probably got me and Bodie on camera! There was also some weird contraption that looked like some stove pipe that was “attached” to a tree. It was one of the strangest things I’ve ever seen in the woods. I have no idea what someone might have used it for. It was really nice to get out in the woods and enjoy the day. I was tired when I got home, but it was a good tired.